Are you you looking for something fun to do with your friends? Tired of eating out and hitting happy hours all the time? If so, Huntsville Escape Room is for you! The one word that accurately describes the entire experience. The staff members were friendly and helped to ease the impending sense of doom my team mates I and felt. Your reservation is only confirmed when you pay online <-- MAJOR KEY! (More on this later). You need between 4-7 people on your team to be successful. You only have one hour to esape and there are a plethora of puzzles that must be solved. My team consisted of 7 people. Three of us knew each other already. The other four people were strangers to us initially. I was the last of the group to arrive. No, I wasn't late...just later than everyone else. 😊 Upon entering the lobby, I recognized Jennifer and Eboni, but was surprised to see the new faces (refer back to the last paragraph). Apparently, the rest of our intended team members dragged their feet on securing their reservation and the slots were purchased by someone else. I shouldn't say "someone else". They were purchased by Jacob, Michelle, Justin, and Bradley. By the end of the experience, I had four new friends. What exactly does awesome mean? Awesome means that all those "useless" skills you've learned over the years and your quirky interests will finally benefit you! WARNING: You will need to use your brain!!! The puzzles aren't hard, but they're challenging...with some more difficult than others. Our team worked extremely well together. Everyone gravitated towards the tasks that they were naturally good at. It definitely helped that everyone was supportive of ideas that were thrown out. You really need everyone's input to escape. 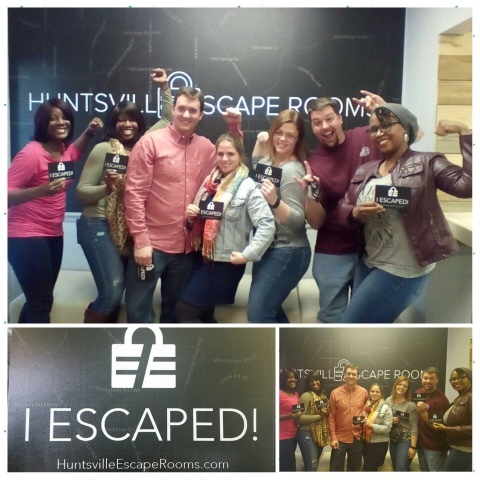 We came, we saw, and we escaped! We only had 53 seconds to spare. Talk about an adrenaline rush!!! After it was over, we all felt like little kids and the conversation immediately turned to when we were signing up for the other scenario. Currently there are two different scenarios to choose from. Two more are in the works. I can't wait to go back!